I do, one day, aspire to dress like this while doing my needlework! 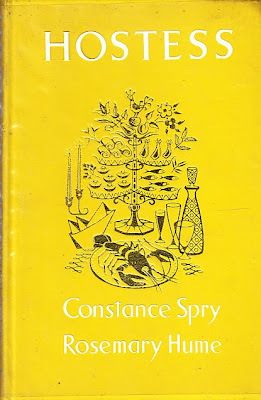 Today's etiquette tips come form Constance Spry, who virtually invented floristry as a profession. Hostess was Spry's last book, finished in rough form a few days before she died. 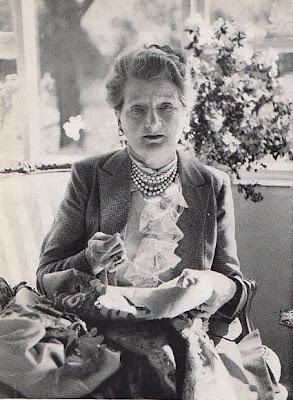 "Mrs. Spry could never have anticipated all the pitfalls into which lesser mortals could fall, but with typical imagination she invited questions from succeeding generations of Winkfield girls, and so her advice ranges over being a good listener and making original tablecloths for a yacht to the ladylike eating of artichokes, and somehow her meticulous attention to detail is never dictatorial." "Winkfield girls" is a reference to a Winkfield Place a school that Constance Spry and Rosemary Hume ran for many years. The school featured a yearlong course on how to cook, how to sew ones own clothes, and how to run a house. Including entertaining in the "homey" part of the house. 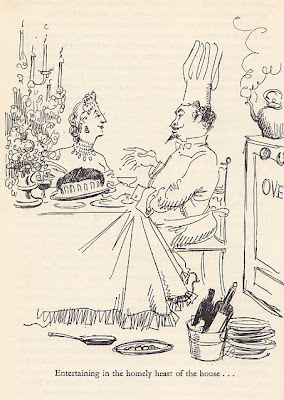 "The near disappearance of the professional cook and the advent of the cook-hostess has done much to change the face of entertaining in England. For example, the cuisine in the type of home in which the cooking was at one time left to people of mediocre attainments and limited imagination has changed greatly for the good." 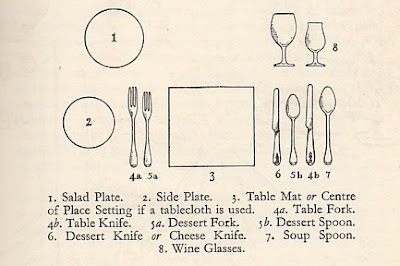 For those who may be of "mediocre attainments" or who have never been seated at any event more formal than a buffet, the is a lovely drawing of a simple table setting. 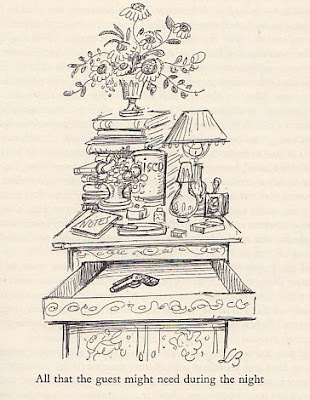 I must say that I do love a book with a drawing of a table setting. Even though for years now, it is simply, fork to the left, knife to the right, I just love these diagrams. Speaking of the drawing in Hostess, they were done by none other than the wonderful Lesley Blanch, of whom I have written before. My favorite drawing in the book is above and it shows everything an overnight guest might need. Notice the gun in the nightstand drawer. Ah, Lesley! "...the chatelaine...was known to be a real dragon...I asked about a convenient time for a morning bath, somehow indicating that I was thinking in terms of the bathroom, whereupon she glanced stonily at me and said: 'Your bath will be brought up to your room." And then in an aside all too clearly audible, she added: "Ladies do not use the bathroom.'" The bathroom is one of my favorite rooms! In addition to Mrs. Spry's hostess tips, Rosemary Hume added a section of timely recipes since one no longer has those tedious kitchen folk to produce their uninspired fare. Head over to Cookbook Of The Day for the "cookbook" portion of Hostess. Ah, the Countess of Home reads so wonderfully here. Quel dommage that it is pronounced Hume. I had two friends who went to Winkworth after school. I was terribly envious and still am of their accomplishments.